The ideal present for the person you don’t know what to get. Give them a Lambeg Golf Shop Gift Card and allow them to get exactly what they want, whether it be an electric golf trolley, a golf bag, a golf trolley accessory or a lightweight Lithium golf battery. 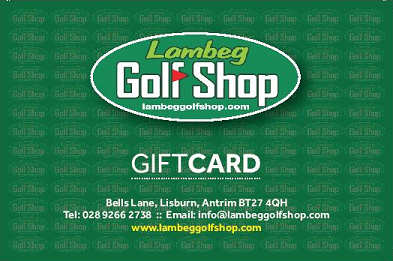 Lambeg Golf Shop Gift Cards can be purchased in store and for any amount. Alternatively, call us on 028 9266 2738 and we can post a gift card to your home or place or work.